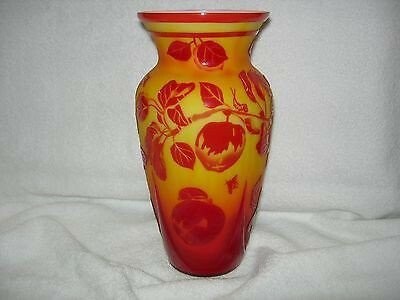 Fenton Persimmon sand carved Vase. Immediate payment is expected via PayPal. PLEASE DO NOT MAKE ANY PAYMENTS AS INSURANCE IS NOT CALCULATED IN THE LIST PRICE ON THE EBLUEJAY CALCUATOR!!!! Please contact me FIRST to GET an ACCURATE SHIPPING COST to your area. Once the shipping cost has been determined I will manually email you an invoice via PAYPAL. PLEASE READ AND UNDERSTAND IF YOU JUST PURCHASE THE ITEM, I WILL NOT SHIP UNTIL INSURANCE HAS BEEN ADDED and any payments you make without shipping cost added in will be REFUNDED. I allow 7 days from the expected delivery date, as indicated on the USPS shipping label, to return any piece that may have been misrepresented. All purchases are final unless misrepresented by the description given.